If you follow us on our brand new Facebook page you would have noticed that last week we sent our puppet of Sir John Kerr, usually on display in the Prime Ministers of Australia exhibition, off to the National Museum of Australia for light fade testing. We are currently undertaking a refresh of a section of the exhibition and our curatorial staff have decided that they would like the puppets to remain on display for a while longer. One of the most important functions of a museum is to exhibit objects to the public. However, displaying objects means exposing them to light which causes unavoidable and irreversible fading. It is important to exhibit objects, but it’s also vital to ensure that they will last as long as possible, and be useful for future generations to study and enjoy. The collections management team at the Museum of Australian Democracy use various methods of monitoring light levels. We also use accepted standards established by conservators to guide us in determining how long different objects should be displayed at particular levels of Lux before they need to be ‘rested’ in storage. These are in the form of broad material-based guidelines, made on the cautious side, for types of objects such as works on paper, black and white or coloured photographs. These blanket rules can’t take into account that each object is different and has different inks or dyes or even print runs and therefore can fade at different rates. Using these blanket guidelines the puppet should be removed from display and rested soon. However, light fade testing gives a much more accurate reading. The National Museum has a Newport Oriel Fading Test System (one of only about 8 in the world!) that can accurately test an object and determine how long it will take for the object to fade. The machine uses a high concentration of light on a miniscule part of the object. This process takes approximately 20 minutes and is unnoticeable to the naked eye. Through documenting how quickly the object fades during this process, staff are able to determine how much longer the object can be displayed. The results from this light fade testing are that we could safely keep Sir John on display for the public to enjoy for up to ten more years. 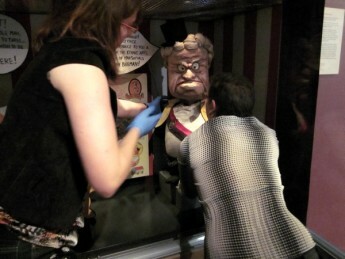 This is fantastic news for us as the puppet is part of an exhibition that is enjoyed by many of our visitors. 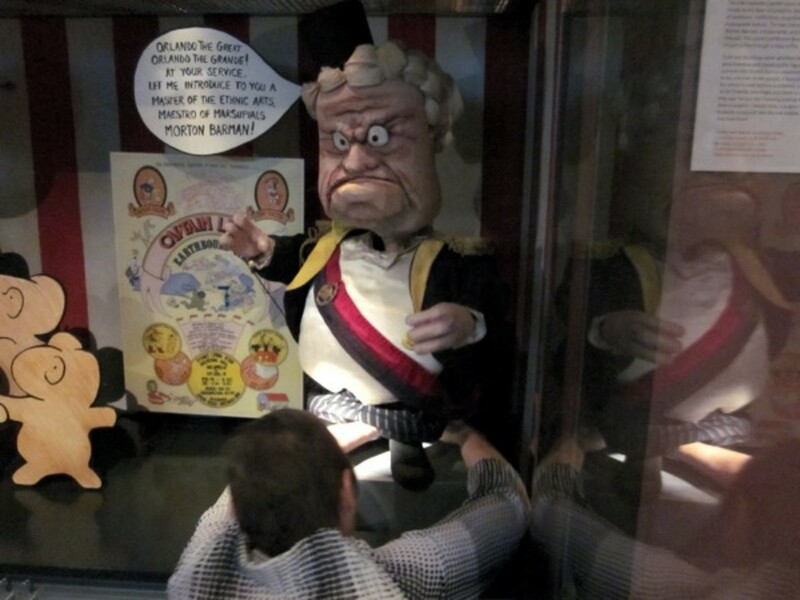 So, come along and see our very cranky looking Sir John Kerr puppet, who is now back in the Prime Ministers of Australia Gallery! Freya Clawley worked at the museum as the Collections Online Officer. She joined the museum as a Registration Assistant in 2009 after graduating from Macquarie University with a Bachelor of Science and a Bachelor of Arts in Museum Studies. While studying she volunteered at the Museum of Ancient Cultures at Macquarie University for five years.